This post is in response to a reader who passed along a thoughtful comment in reaction to my newspaper column (pasted below). Her comments were rather encouraging, but they provide an opportunity to expound on something I’ve been thinking a lot of these days. The barrage of social media in our lives can produce an overwhelming sense of inadequacy—a feeling of not measuring up. The greater sense of connection with loved ones is tremendously positive, but we must not fall into the trap of comparing ourselves to others. If the average person has say 300 – 500 “friends” on Facebook, they will see dozens of pictures of beautiful families doing awesome things together every time they log in. Fabulous vacations, trips to restaurants, and laudable achievements are displayed, which are often unachievable for the rest of us. Our minds devilishly convince us that we are failing to measure up if we can’t afford the vacations or restaurants. Perhaps we haven’t had a lot of quality time with kids of late. Well, just remember that everyone else out there has these same feelings of inadequacy. They are generally posting photos of the extraordinary, as we all do. Everyone has humdrum moments when they aren’t looking gorgeous, kids are melting down, and we are too darn exhausted to do much that’s “meaningful.” I just want you to know that I can relate. When it comes time to crank out a column for the paper, I write about such events. I ponder the fact that the average reader may think I’m some sort of hyper-energetic and engaged Dad-of-the-year sort. My strength lies in the planning of fun and engaging events. I’m darn good at these. One of the best, in fact. BUT, I bet these occur maybe 2 – 4 times per month. It’s the stuff of daily life that overwhelms me: an emotional kid circling the drain, being consistent as a parent, being fully present while simultaneously stressing over what the future may or may not hold, etc. I don’t have space in the column or in these blog posts to go into these—the real stuff of daily life—and neither does anybody else. I’m merely trying to convey another way of being, a certain feeling and zest for life, and to encourage people to think creatively about how they fill their time. I certainly haven’t “arrived.” I definitely feel mediocre as a parent, in my spiritual pilgrimage, as a husband, etc. Basically, I’m fairly average. While I strive to be better, and will continue in this, “average” places me among the great throng of humanity that also struggles in this. Rather than bemoan the fact that we haven’t arrived, lets all rejoice in the journey. We’re all in this together. There is so much that I can learn from you, and I’m so thankful for that! I’ve been thinking about this all day, since I read it this morning. “I stacked the deck further by inviting the neighbor kids. It often helps to bring a friend. Due to my own deficiencies as a parent, perhaps, my kids don’t jump at the opportunity to go to art shows and museums.” I’m not sure I see the deficiencies of parenting here. It sounds like you sized up the limitations, addressed them and everyone wins. Art and creativity come naturally to children. Drawings and paintings burst out spontaneously as they learn to interpret their world. However, around fifth or sixth grade it’s fairly typical for these same kids to give up because they are unable to produce images that are comparable to a photograph. As my kids enter this transitional age, I seek out anchor points to encourage them to remain tethered to their innate creativity and playfulness. Today’s students endure a world of testing. Specific answers are required. An inordinate amount of instruction time is devoted to preparing for these all-important tests (which aren’t going away, though everyone seems to hate them). Thus, the left brain develops while the right brain may languish. Ideally, both hemispheres of the brain should grow and mature at similar rates. Each is equally necessary for successfully navigating the real world. They should work in tandem. Problem solving requires creativity—not rote answers. As a parent, it’s my responsibility to expose them to the arts, while simultaneously encouraging them to use and develop their own innate talents. 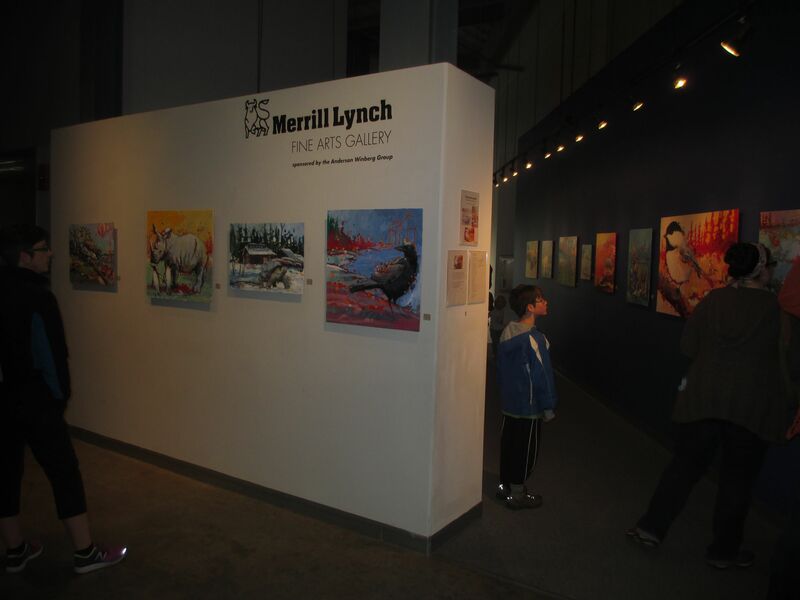 Duluth possesses a remarkably vibrant community of artists. 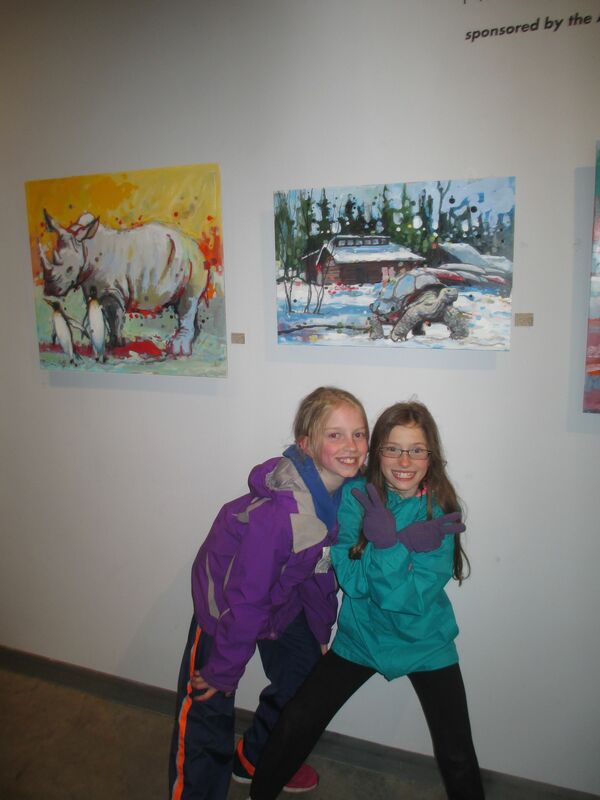 Easy access to great, culturally relevant artwork provides immediate advantages to our children. I happened to marry a talented painter, but I still feel like a neophyte in my knowledge of the visual arts. 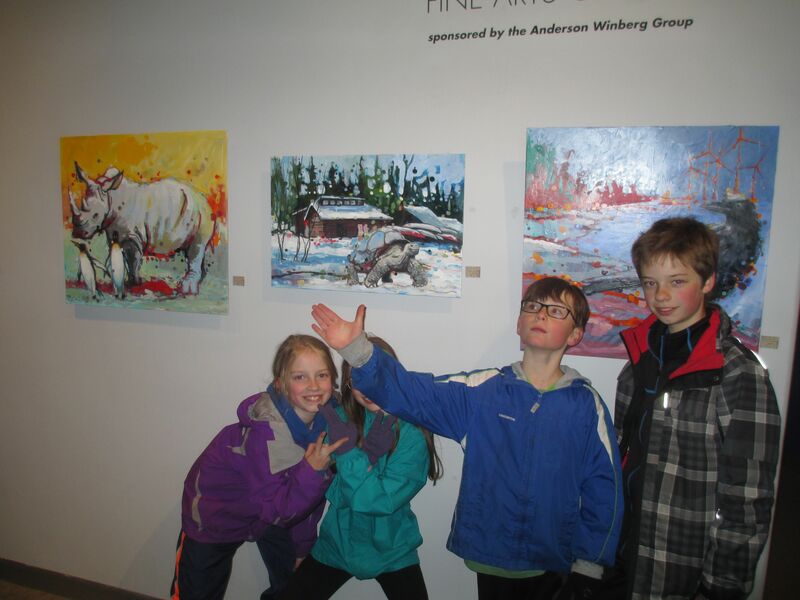 Even for someone like me, and you, it is surprisingly simple to expose kids to great art in this town. Adam Swanson, for example, currently has 27 exquisite pieces on display at the Great Lakes Aquarium. His work is full of whimsy, bright colors, texture, humor, and animals. These attributes make his work tremendously kid-friendly. Swanson’s paintings provide both highbrow and lowbrow accessibility. When I recently received an invite to attend the free opening to his show at the aquarium, I seized on the opportunity. Due to the aquarium’s close access to Playfront Park and Bayfront, it was an ideal family activity. 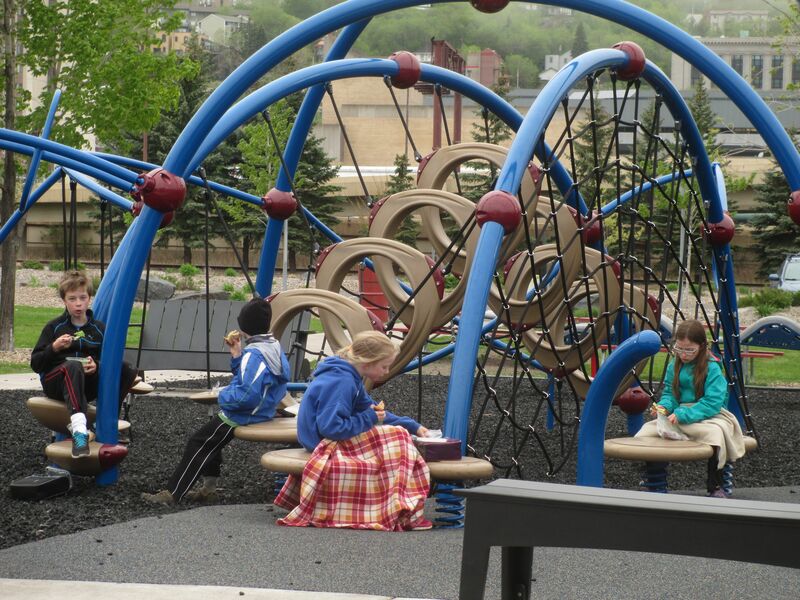 If the kids were to get bored, the playground would be available sooner rather than later. This took the pressure out of the equation. I stacked the deck further by inviting the neighbor kids. It often helps to bring a friend. Due to my own deficiencies as a parent, perhaps, my kids don’t jump at the opportunity to go to art shows and museums. Feeling strongly that brains and bodies function best when both are exercised, I hatched a plan for us all to bike six miles each way to the show. This sounded like a great idea when it was 83 degrees the day before, but the day of the opening saw the temperature plummet to half that. 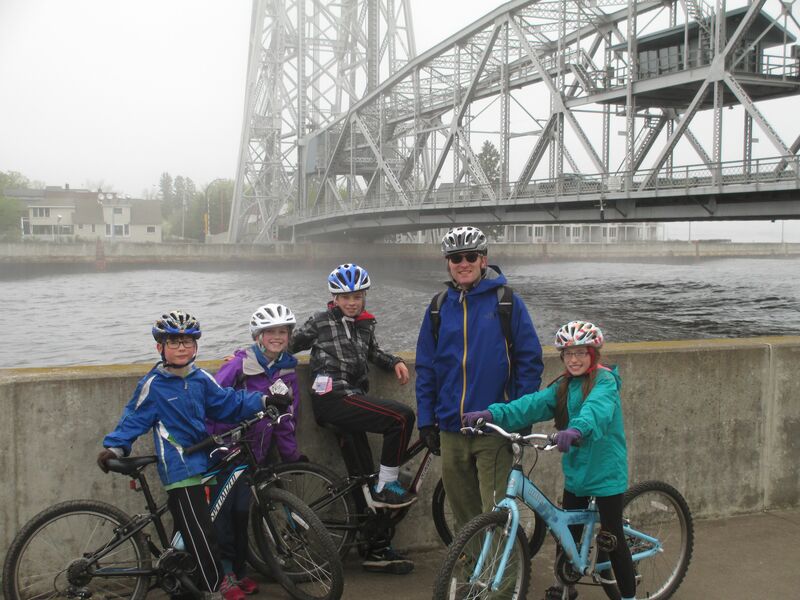 Forty-two degrees, fog, and wind, made for a unique spring bike-ride that only Duluth can provide. To my astonishment, the kids thrived through this adversity. They felt proud to complete the ride on a mostly empty Lakewalk, and learned that fun is more dependent on attitude than on external factors. Arriving at the art-opening shorty after we cruised under the Lift Bridge mere feet from enormous rolling waves in the canal, the kids were refreshed and jazzed. More importantly, they were ready to do something relaxing indoors. My requirement was that they put in at least 10 minutes, but they lasted more than twice that. All I did was point out that Adam’s works are not overly realistic. They are creative and playful, while containing easily recognizable animals. It’s vital for children to see adults creating vibrant, imagination-pricking artwork. Viewing it firsthand—having the opportunity to greet the artist—stretched the kids in unique ways. The work is impressively rich in person. More vibrant. More alive. The paintings are three-dimensional—boldly textured with scrapes and brush-strokes. Bright, vivid color is eye-puckering. Subtle humor presents itself on large paintings, which is lost on small two-dimensional screens. Our kids need more of these experiences. Bodies warmed by the ride and spirits by a dose of culture, the kids contentedly ate supper picnic-style outside in the fog in brutally cold conditions. They felt more alive than usual. 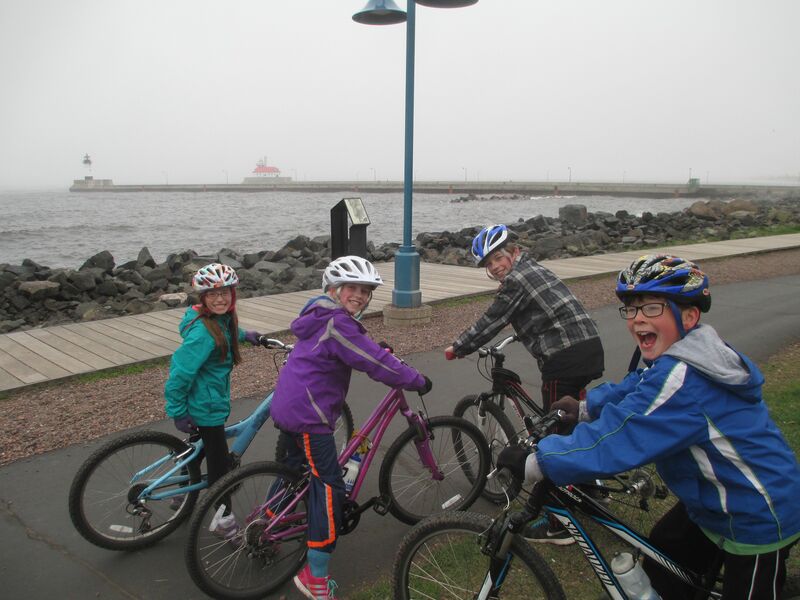 Such activities are plentiful in Duluth, and usually free. Families and friendships flourish while enjoying them together. Be creative. Together. Eddie, I really enjoy reading your thoughts. I was reading Krishamurti’s thoughts on “education”, and that ties in really well with ideas you mention here. 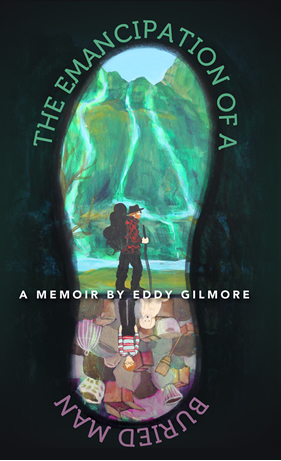 If you had not read, I highly recommend. Sounds like an awesome day. I see my kids brains just go on fire anytime we go to a live theater show.